Mayor Crombie joins members of the Ahmadiyya Muslim community for a cheque presentation of $10,000 to The Mississauga Food Bank. 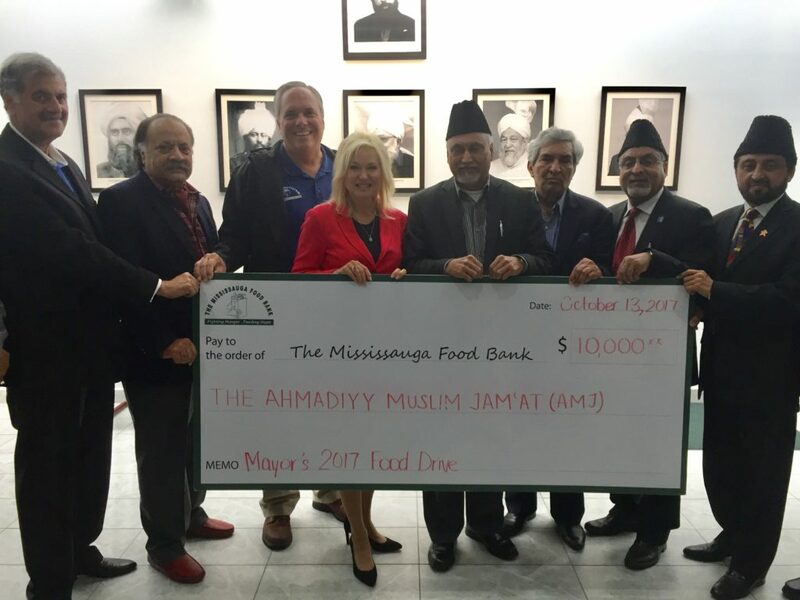 On behalf of everyone involved in the 2017 Mayor’s City-Wide Food Drive, we want to acknowledge the compassionate members of Mississauga’s Ahmadiyya Muslim community who raised an incredible $10,000 and 25,000 pounds to support The Mississauga Food Bank’s ongoing work to help hungry neighbours in need, Mayor Bonnie Crombie said. Mayor Crombie would like to extend an invitation to you to join us at the 2017 Mayor’s Citywide Food Drive campaign wrap and results announcement on Wednesday, October 18th at 4:00 PM. This year’s campaign goals were to raise $125,000 and 225,000 pounds of food from September 16 – October 13. Achieving these goals would make it the Mississauga Food Bank’s biggest Thanksgiving ever.